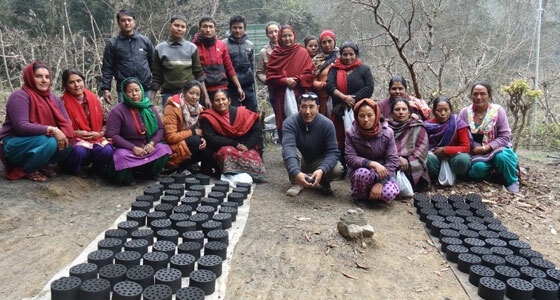 A two-day training was organised at the International Centre for Integrated Mountain Development (ICIMOD) Knowledge Park at Godavari for community forestry user group members from Godavari Kunda FUG, Yale Youth Club from Lalitpur District and Water User Group Members from Kavre District promoting bio-briquette making technology as an alternative source of energy for cooking and heating. It encouraged farmer participants to use the technology as an alternative source of income generation. Nineteen participants from three different organisations participated. Among them, 16 participants were women. Topics covered during the training were the collection of biomass, preparation of charcoal for unwanted biomass including pine needles, charcoal grinding, mixing charcoal powder and clay soil into a paste preparation and the production of beehive-type of bio-briquettes. Participants were were divided into two groups based on their VDC as Kavre and Lalitpur District groups. 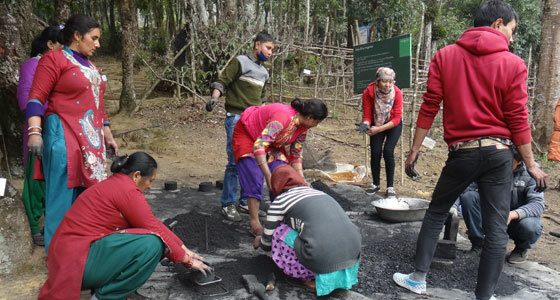 After dividing into working groups, a square mete, waist-deep pit was prepared to burn dried biomass and prepare charcoal using two different methods — covering the pit with green grass and soil and by sprinkling water above the pit. The charcoal collected from the pit was ground into a fine powder. A ratio of 3:1 charcoal to clay soil was mixed with water to make a paste. Paste was then put into an iron mould, compacted into its final form, and left to dry. During the training, each participant was asked to produce at least ten briquettes to become familiar with the process. 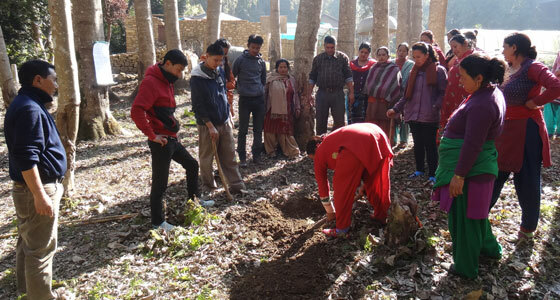 Participants from Godavari Kunda said the skills they have acquired during the training would be useful in their community as bio-briquettes could be a source of income generation and meet the existing fuel crisis by using biomass that is unused in the forest.